The Department of Defense awarded a major planning grant to conduct a Joint Land Use Study (JLUS) in the Fort Bragg region in 2016. The purpose of the study was to assess the potential threat to the military training mission from incompatible urban growth and development that has occurred in the areas surrounding Fort Bragg and Camp Mackall since the completion of the 2005 BRAC process. 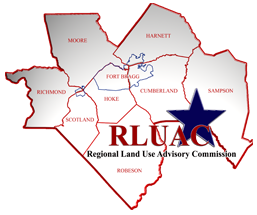 The grant was awarded to the Mid-Carolina Council of Governments and will be managed through the Regional Land Use Advisory Commission (RLUAC) Board of Directors and Full Commission. The study began with a project administration meeting in September 2016 and was completed in September 2018. Throughout that period the RLUAC Board of Directors, full Commission, and the planning consultant, Benchmark Planning, conducted numerous meetings with local government officials and private citizens to provide and informaiton about the study and obtain input. A broad range of twenty-nine recommendations were developed for consideration by the study partners in the region. The recommendations were organized into four categories as outlined below. The completed Joint Land Use Study can be downloaded by clicking here. If you have a comment or question, please click here.